In 2018, NoLi CDC embarked on a process called an Equity Audit, which was executed by Desiree Adaway and The Adaway Group. The goal was to assess NoLi CDC’s positioning around Diversity Equity and Inclusion, and the use of a social justice lens in programs and communication. Specifically, this was a process to hold a mirror up to ourselves, and understand how we are doing in being as inclusive as we need to be. 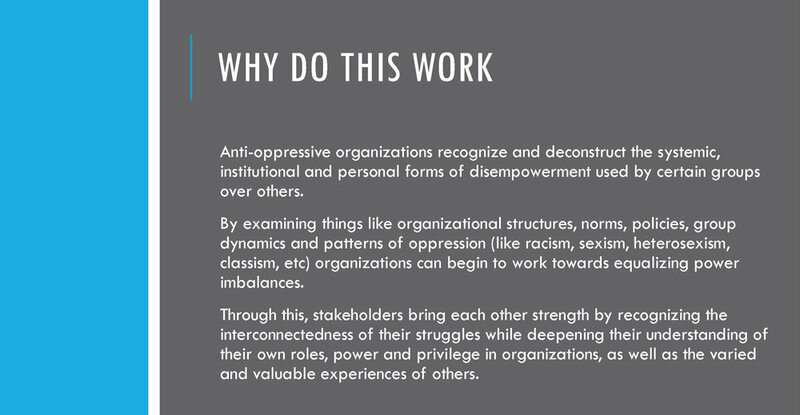 The Audit was aimed at surfacing any language, images or content that is oppressive, biased, or exclusionary; identifying places in which the commitment to inclusivity and equity can be made more visible; providing insight into how training materials might be updated to reflect the desire to make programs and processes more inclusive and welcoming to folks from underrepresented backgrounds; making recommendations for next steps and where appropriate provide examples from other organizations to illustrate best practices. From July to October 2018, The Adaway Group interviewed 20 people close to the organization, made up of staff, board, program partners, and neighbors. From that, a survey was developed that was then distributed in as many ways as we could think of, to gather input. Ultimately, we had 222 respondents to the survey. The results of the surveys is below. The Equity Audit became, in addition to another great opportunity to listen to our neighbors and their voices, a way to get a 3rd party assessment of the work we’ve done and how we’ve done it. It has caused a shift in how we are thinking about our work, how we communicate, how we are staffing our work, and so much more. It has been the reason why we have shifted our previously widely varied work to a very focused emphasis on the Northside Common Market project, as a response to the input received in this process as well as many others.